This property has +/- 307 highly desirable acres and is located in the Burnt Store corridor of southern Charlotte County, Florida. Bonita Bay Group owns 760 highly desirable acres located in the Burnt Store corridor of southern Charlotte County, Florida. This property has three different levels of entitlement and could potentially be developed as separate communities. The southern 300-acre parcel is the subject of this description. Land holdings by other residential and commercial developers as well as conventional platted residential land to the east. It lies just northeast of the Lennar Tern Bay project. PD, allowing up to 810 residential units. This zoning was approved under the new Comp Plan designation Village Residential, which allows residential development up to 5 units per gross acre. Environmental permitting from the South West Florida Water Management District is complete. A Phase I Audit was conducted in 2003 and subsequent soil tests were conducted in Phase II. 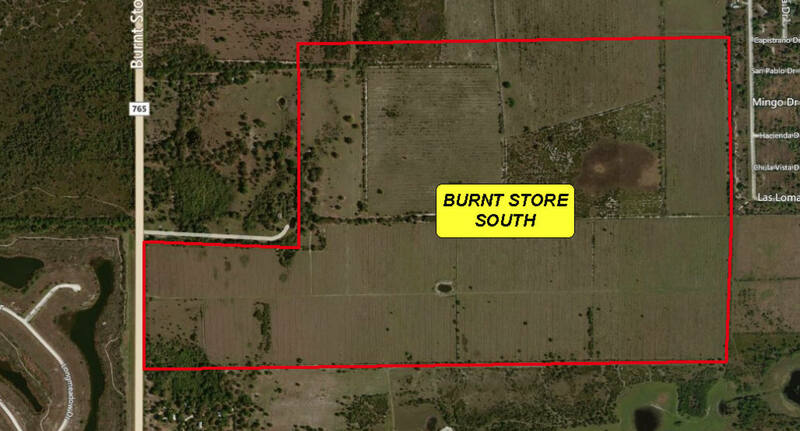 Charlotte County Utilities has expanded some utility capacity in the Burnt Store Area. Additional utility expansion may be required depending final design and unit counts. Depending on design, some offsite fill may be required. Charlotte County completed a four-lane section of Burnt Store Road from US 41 to Notre Dame Boulevard.